The CA3162E and CA3162AE are I 2L monolithic A/D converters that provide a 3 digit multiplexed BCD output. 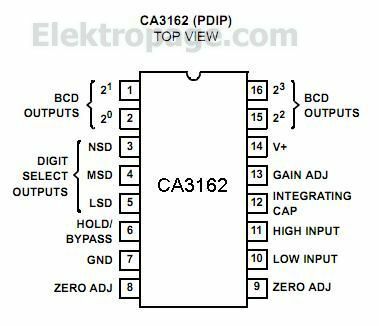 They are used with the CA3161E BCD-to-Seven-Segment Decoder/Driver and a minimum of external parts to implement a complete 3-digit display. The CA3162AE is identical to the CA3162E except for an extended operating temperature range. The CA3161E is described in the Display Drivers section of this data book.